Grow Your Chapter - Request One (or more) Today! 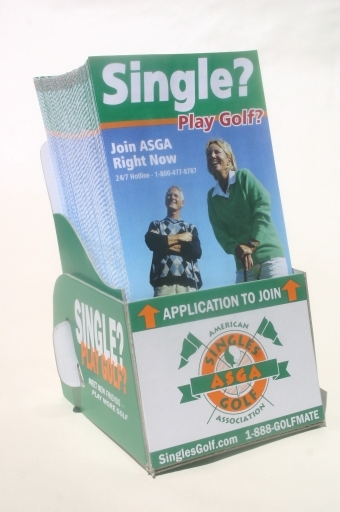 Since our inception sometime last century, the American Singles Golf Association has grown simply by word-of-mouth and some great articles and TV stories about us. Adding to this, we've created a beautiful brochure stand for chapters to use to grow their membership (see photo below). The brochures are actually a brochure-application form that becomes a self-mailer. It's an attention getter and has a built-in, sealable, business reply mail envelope allowing the application to include a credit card number or check securely. Chapters will each be sent as many brochure stands. Each stand will hold about 20 brochure-application forms. This is a departure from our previous brochure stand whereby the stands held 200 brochures and many were wasted. "The preferred placement on these should be golf pro shops and other retail golf shops," says Tom Alsop, president and founder of ASGA. "Our obvious target audience is golfers and that's where we want to spend our advertising dollars." Local chapter presidents or local membership committee chairpersons may request up to forty display stands and individuals members may request up to two (2) display stands. Just complete the CONTACT US button at left and ASGA will ship them to you at no charge. The photo below is a representation of the actual stand you'll receive.